A relatively good week this week, especially noting how the market held up in view of the poor earnings from Google and Microsoft. I am still concerned about the price relationship to the upward channel (note chart below, green circle), but I’ll take it. Volume has been “average”, which is encouraging. 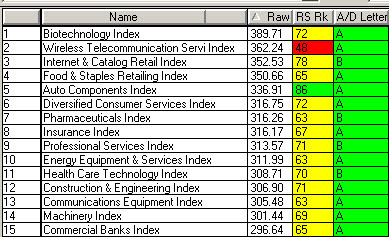 Really not much to add here, except the top sectors (see table below). They are in rank order according to near term strength. RS = Relative Strength to the S&P 500 Index, while A/D = Accumulation / Distribution (i.e. money flowing in or out). These areas tend to be “good places” to be right now if you have a choice. I’m seeing most of my stock “buy candidates” in these sectors. They tend to do well in up markets and hold up well during a correction, and that’s a very positive sign as investors are reluctant to sell. If you were shaken out of the market during the interest rate scare and have not gotten back in I’d say be patient. 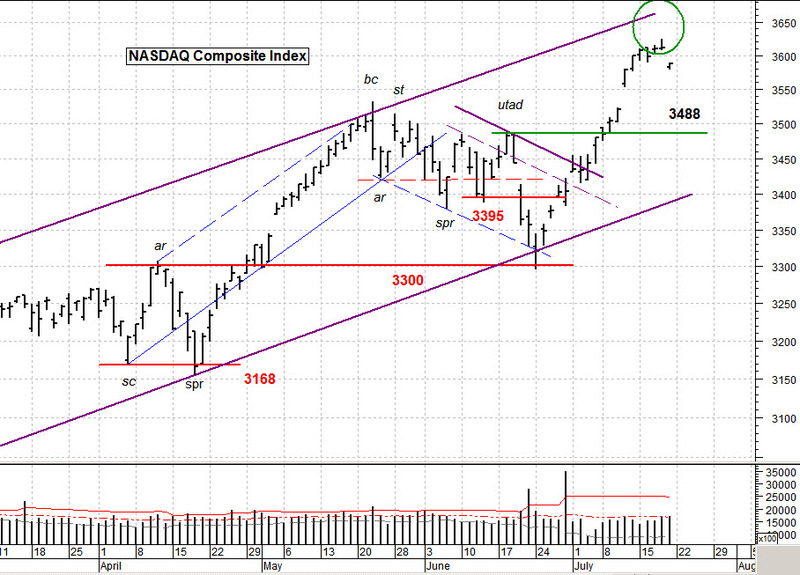 A modest 1-2 day correction will appear. There have been very few places to get long here unless you are looking intraday, say on a 1 hour or 15 minute bar chart. A few minor swoons but that’s it. chart courtesy of MetaStock; table by www. HighGrowInvestor.com. Used with permission.